Next, the chamber fills up with hot water for a 3-minute massage bath. High-pressure jets create a powerful whirlpool, and scores of knobby, golf ball-sized "massage balls" suspended in the water pelt the body, delivering a vigorous massage intended to stimulate blood circulation. An ultrasonic wave generator creates a ticklish cloud of tiny air bubbles that lift dirt from the skin. 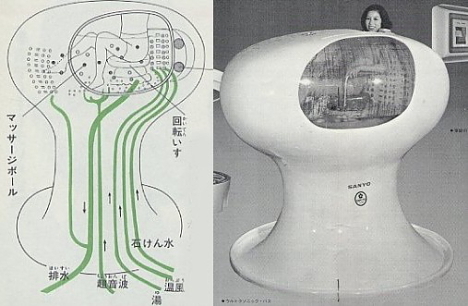 Developed as a concept model, the Ultrasonic Bath never made it into our homes. Several years ago, however, Sanyo unveiled the $50,000 HIRB ("Human In Roll-lo Bathing") system, a compact version designed for use in elderly homes. Hi, can I get myself tumble dried low. Did it come with its own ladder or was that additional option cost? This is kind of like an ultrasonic jewelry cleaner scaled up to human size. how can i get more information about it ..?? Reparando » Blog Archive » Lavadoras ultras�nicas para las personas. Planeta Gadget » Ba�o con ultrasonido en 1970.